What does bootstrap paradox mean? 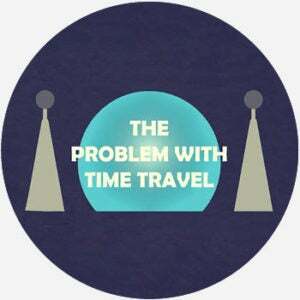 The bootstrap paradox is a hypothetical causal loop in time travel in which one event causes a second, which was actually the cause of the first. Cleaning up a bootstrap paradox is even worse. With those, you’ve got to erase a parasitic time segment that’s been entangled with a host timeline. Screw that up, and you could end up erasing both. Talk about paperwork. Yeesh. Where does bootstrap paradox come from? Though thought experiments about time travel date back centuries, the bootstrap paradox comes from Robert Heinlein’s story “By His Bootstraps.” It was published in the October, 1941 issue of the Astounding Science Fiction magazine under the pseudonym Anson MacDonald. The term bootstrap paradox comes from the title of the story and the idiom pulling yourself up by your bootstraps, a nod to a future version of oneself influencing the life of a past version. As the idiom originally observes, it’s impossible to pull yourself up by your own bootstraps—unless you’re a time traveler. In the story, main character Bob Wilson is working on his graduate thesis on time travel when a future version of himself (who he does not recognize) appears through a time portal. He then becomes ensnared in a causal loop, traveling backward and forward through the time portal and encountering multiple versions of himself from different points in his timeline. By the end of the story, his futile efforts to break the timeline have led to the first instance of Bob meeting his future self, bringing the loop full circle. Since the 1940s, the bootstrap paradox has made its way into popular culture. Science-fiction TV series Continuum and Doctor Who, for instance, often deal with the bootstrap paradox as both series involve time travel. Google searches for bootstrap paradox hit their all-time height in October, 2015, when an episode of Doctor Who dealing with the bootstrap paradox aired. In the episode, the Doctor explains the paradox in terms of Beethoven: A fan of Beethoven travels back in time to meet her favorite composer and realizes he hasn’t yet written his Fifth Symphony, so the fan writes it for him and Beethoven publishes it. So, who wrote it? Most popularly, discussions of the bootstrap paradox arise in discussions of science fiction, especially in TV and film. It has become a trope of the science-fiction genre. Outside of popular culture, the bootstrap paradox is also known as the ontological paradox.